Group Use Shelter Reservations and campsites for Court Sheriff and Hellgate Campgrounds can be reserved at recreation.gov. Toll-free reservation line: 1-877-444-6777. Some of Reclamation's earliest projects were built in Montana. Work began on the Lower Yellowstone Project in 1905 just three years after the agency was created. Today there are 13 projects east of the Continental Divide - the portion of the state managed by the GP Region. There are 13 dams and reservoirs, 9 diversion dams, 10 pumping plants and 2 power plants which provide a variety of benefits and meet multiple needs, including recreation. The Montana Area Office (MTAO) in Billings manages Reclamation's projects and programs in this part of the state and spends $7.5 million annually for operation and maintenance. Most of the Montana development occurred under the Pick-Sloan Missouri Basin Program, including the large Yellowtail and Canyon Ferry units. Both provide considerable storage for irrigation and power generation and are popular recreation areas. Yellowtail and Canyon Ferry power plants produce about 43 percent of the GP Region's annual power generation, resulting in about $15 million in revenue each year. The Montana projects provide water to 352,915 acres of land which produced $78.5 million worth of crops in 1990. Principal crops are sugar beets, hay, corn, wheat and barley. 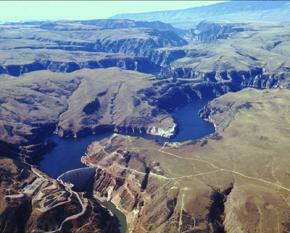 Over 1 million visitor days are spent at Reclamation facilities in Montana each year.